Warrant Officer II is the 2nd highest rank attainable by an enlisted Army soldier. A Non Commission Officer (NCO), could also be 'direct commission' to be a Specialised or Technical Officer with mastery of their technical speciality. Warrant Officers are expert in their own fields whether being a tactical or technical leaders. They make up only a small percentage of the Army population but are chosen for their abilities to undertake roles that entails great responsibilities that often require a special skill set. Warrant Officers (WO's) are very experience soldiers and serve as example for younger soldier in the Unit. Being leaders, they are entrusted to lead, train and guide enlisted soldier under them. They are the vital links between the Unit Officers and their soldiers and ensured that given instructions are followed and Unit Standing Operation Procedures (SOP) adhered to during operations. They know their men well and can readily lead them into battle along side their Officers. They managed their men and shared their opinion's with their Officers when call upon. I met WO 2 Wong Foh Lim (Rtd) S/N 201633 (Foh Lim) during MACVA 2018 AGM held at 11 Bde Officers Mess, Sg Buloh Camp, Sg Buloh on 24 Feb 18. He presented a Coffee Table Book (CTB) Montage entitled 'To Our Fathers Lest We Forget' to MACVA President Maj Tan Pau Son. The CTB which was produced by Michael Choo in 2016, traced the history of 5 Chinese soldiers that have answered the nation call by serving with the Federation Regiments in the 1950's with Foh Lim being one of them. The others are SSgt Soon Poh Lee (Rtd) S/N 201207; Sgt Ho Kim San (Rtd) S/N 202492; the late Sgt Lim Cheng Ngan (Rtd) S/N 203803 and the late LCpl Choo Kim Yat (Rtd) S/N 202646; father of Michael Choo. Like most WO's that I have the opportunity to serve with during my service and like most MACVs (Malaysian Armed Forces Chinese Veterans) WO's that I have met, Foh Lim much like them is proud of what he had contributed to the nation through his years of dedicated service in the Malaysian Armed Forces. We met again at Tugu Negara on 31 Jul 18 and our subsequent conversation led to the writing and compilation of this article. MACVA Archives record's MACVs contributions to the nation through their services with the Malaysian Armed Forces. It is a tribute and reminder that their services and sacrifices help paved the way of what our country have and enjoy today. A true brief story of my career in the Malaysian Armed Forces and never have I regretted it in my life. I was born in Ulu Soloh, Paya Rumput, Melaka on the 17th of May, 1935 and I have six brothers and two sisters in my family. My late beloved father was a Kampung Chief while my late mother was a housewife. As per my knowledge, World War I happened from 1914 to 1918 where George 5th was King of United Kingdom. World War II happened from 1939 to 1945 where the Japanese surrendered on the 15th of August, 1945. Millions of lives were lost during both war. Malaya Government declared Emergency from 1948 to 1960. During that period, the Government does not have enough manpower hence the Ministry of Defence decided to send their officers to various schools to seek students from Form 3 to Form 5 to join the Army. It is also during the same period where my parents past away and hence my elder brothers and sisters took care of us. In 1952, my third brother joined the Police Forces as a Constable and in 1954, I had to stop my Form 3 education and joined the Army along with my fourth brother. We both attended training at Taiping Camp, Perak for 4 months and at Port Dickson for another 4 months. I was fortunate enough that I was appointed as Lance Corporal immediately after training completion and two years later I was promoted to Full Corporal. We had to serve a minimum of 7 Regular years of service and 5 years as Reserved. However my fourth brother decided to quit the Army after serving 7 years but I continued to stay with the Federation Regiments till 1976. 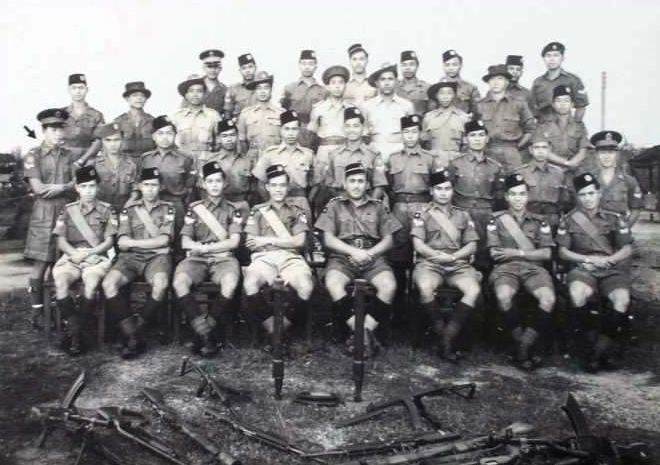 G Squad D Company, 1st Federation Regiment, Port Dickson, August 1954. During my tenure as Full Corporal, I had undergone Anti-Terrorist Warfare training course at the Training Wing Port Dickson and led the soldiers to the jungle to fight with the Communist for a total of eight years. As I recalled, those forces involved in battling with the Communist were the Malay Regiment; Police Jungle Squad; Federation Regiment; Homeguard; Australian Regiment; New Zealand Regiment; Fiji Regiment; Gurkhas Regiment and Orang-orang Kampong. Jungle Warfare Course, Training Wing, Port Dickson, 5 Mac 1956 - 7 April 1956. D Company, First Battalion, Federation Regiment, Malaya Special Tiger Squad, taken at Hobart Camp, Gurun, Kedah in 1956. Front Row: 201352 LCpl Mazlan, 201192 Cpl Ismail, 201467 Pvt Mohd Sidek, 201478 Pvt Mohd Nayan, 201084 LCpl Yahaya. Centre Row: Flight Pilot Capt A.James, 201452 Pvt Mohd Ali, 201002 Sgt Yew Tien, 201263 Pvt Abu Bakar, 201383 LCpl Ahmad P.O., 201643 Pvt Peter Ng, 201053 Cpl Hashim. Back Row: 201626 LCpl Lee, 201132 Cpl Abd Kadir, Flight Co-Pilot Lt Lam, 201697 LCpl Mak Chong, Lt Harchand Singh, 201633 Cpl Wong Poh Lim. In 1956, general jungle operation were performed to clear the areas for 72 hours before the 'Baling Talk' which took place at a Government English School on 28th December 1956. Most of the areas were covered by the Federation Regiments due to its multi-races setup. They are responsible to patrol the enemy's position, search, ambush, capture, destroy or kill the enemy. There was a time where the bombs were mistakenly dropped at our nearby areas and we had to take cover behind big tree, rocks and rivers. Fortunately there was no casualty in our troop. While we were still in the jungle, there were reward offered to those who are able to capture Chin Peng (RM250,000.00). Chin Peng requested Tunku Abdul Rahman for a 48 hours Cease-fire Agreement to attend the talk. Tunku Abdul Rahman agreed to the request and the meeting were well-organised. Malayan Communist Party (MCP) was represented by Chin Peng, the Secretary-General, Rashid Maidin and Chen Tien, head of the MCP's Central Propaganda Department. On the other side were three elected national representatives; Tunku Abdul Rahman, Dato Tan Cheng Lock and David Marshall. In that meeting, Tunku Abdul Rahman gave Chin Peng a chance to surrender in order for Malaya to be an independence country. Chin Peng would only agreed if the following conditions were met; upon surrender, recognition of the Malayan Communist Party; no detention; no investigation; and no restriction on their movements. Unfortunately the meeting ended with no agreement hence the Emergency situation continue to takes place until 1960. Finally a Peace Agreement mark the end of the Communist Insurgency in Malaysia were agreed and signed by both MCP and Malaysia Government on 2nd December 1989 at Lee Gardens Hotel, Hat Yai, Thailand. We were the one fighting with Communist Terrorist in Malaya and help secured Malaysia independence. On 1 January 1960, the Federation Regiment was merged with the Federation Reconnaissance Regiment and renamed the Federation Reconnaissance Corps. Sarawak and Sabah joined Malaysia in 1963 and in the same year, Indonesia confronted with Malaysia where their forces landed in Labis area. 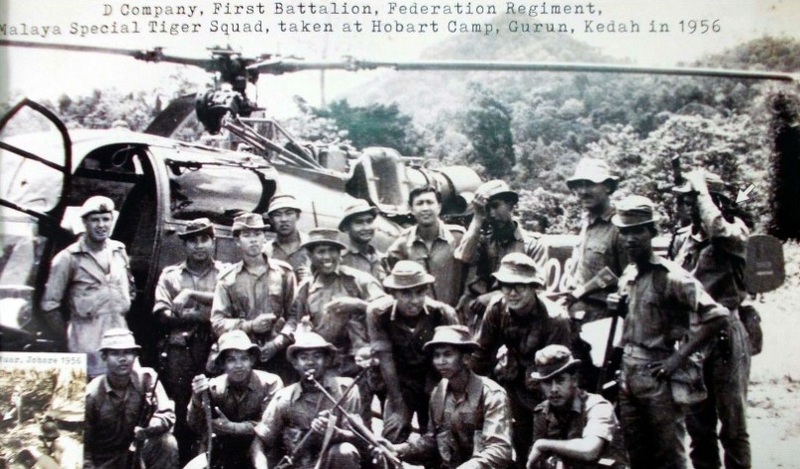 In 1963, the Malaysian Ranger were formed and in 1965, the Malayan Commando were formed. In 1965, Singapore asked to be independence from Malaysia. In 1969, VAT69 were formed. a. To serve, protect and safeguard our country's sovereignty. b. To ensure peace, harmony, security and indepencence for our country and our loved ones. c.	To be a good and loyal citizen of Malaysia; to come forward to work together as One family without fear or favour in defending our country. Today, I, Wong Foh Lim, proud to be a Malaysian and fortunate to have seven children, eleven grandchildren and one great grandchildren. A Young Wong Foh Lim. Lintang Camp, Sungai Siput, Perak. 201630 LCpl Wong Foh Gin (R) with 201040 Pvt Kok Choon (L), 1958. 26 November 1956. Hobart Camp, Gurun, Kedah, 1956. Tunku Abdul Rahman Putra Al-Haj officiated The Opening of Sungai Udang Camp, Malacca 8th June 1957. Armed Forces Rifles Meeting Champion 1958. Sg Udang Camp, Malacca 1957 - 1958. Tent Demonstration for Jungle Operation 1957. Weapon Training in Firing Range, Sg. Udang Camp. B Company, First Battalion, Federation Regiment, 9th December 1959. Sergeant Mess Party, Sg Udang Camp, Malacca 1959. 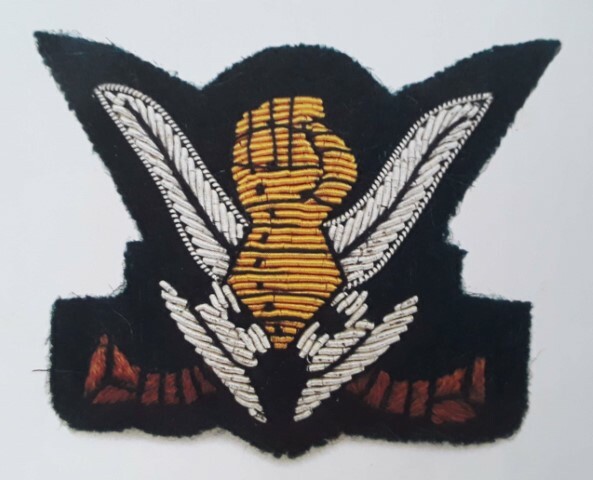 ONUC (Organisation des Nations Unies au Congo) Malayan Special Forces 1960. Onboard U.S.N.S General R.M. Blatchford Troopship. Port of Dar es Salaam, Tanzania. Bukavu, Congo. 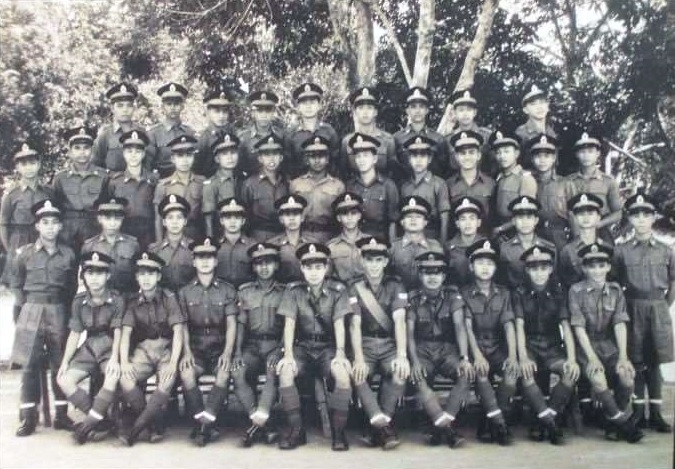 Passing Out Parade, Recruit Training Centre, Port Dickson 1962 -1966. Best Squad Award, Recruit Training Centre, Port Dickson. From: 30 Oct 65 To: 27 Nov 65. Farewell to Dato' Jaafar Onn - RMC Sg. Besi Camp, Kuala Lumpur. RMC Tae Kwon Do Club 8th Sept 1968. Sergent Mess, Suggala Camp, Port Dickson 1970. Major General Mohmood Sulaiman visited Penrissen Camp, Kuching, 1971. Official Visit of Prime Minister Tun Abdul Razak to First Brigade Kuching,Sarawak. Farewell to Lt Col Idris Merican at 1st Brigade Kuching, Sarawak 1971. C squadron 3 Peninjau DiRaja, Bau, Kuching, Sarawak 1973. Foh Lim presenting suggestion during MACVA Inaugural AGM at KRAT, 19 Mac 17. Foh Lim with school children at Tugu Negara, 31 Jul 18. 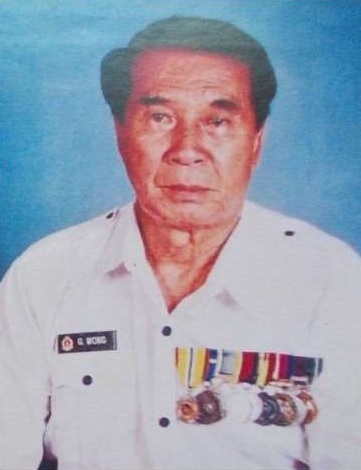 WO II Wong Foh Lim (Rtd) S/N 201633 retired from the Malaysian Army on 1st May, 1976 after serving with pride and dedication for 22 years. As a proud Malaysia citizen, he strive to serve the country which he calls his home by joining the Malaysia Armed Forces and bravely fought off all enemies of his beloved country. His services for the King and Country and experiences gained with the Malaysian Army made him a formidable man and one which have much to share. Foh Lim is 83 years old and resides in Taman Muzaffar Shah, Air Keroh, Hang Tuah Jaya, Melaka. As a Veteran, he can look back with pride at all those years that he had spent serving with other Malaysian Veterans; providing peace and harmony for a Malaysia still in an infancy stage. MACVA is very proud of his achievements and sacrifices for King and country and wishes him good spirit and good health in enjoying his retirement and attending many more Warriors Day celebrations. Kwai Yinn with Foh Lim at Tugu Negara, 31 Jul 18. Reproduced from CTB Montage 'To Our Fathers Lest We Forget' by Micheal Choo (2016) with permission from WO II Wong Foh Lim (Rtd) and Micheal Choo.